Bitcoin is a new digital currency that is open source, distributed, and has no central issuing authority. It is not backed by anything physical, like gold, yet it has been designed so that only a fixed number of bitcoins can ever be created. Bitcoins and bitcoin transactions are protected from counterfeiting and double spending by strong cryptography. Because there is no issuing authority, there are no fees for transactions, although fees may be charged for changing into other currencies, escrow services, etc. Like gold, bitcoin is a form of free market money: money chosen by the people who use it because it suits their needs, rather than being money because some government decrees that its subjects shall use it, and backs up that order with force if necessary (legal tender laws). Being a very young money, bitcoin does not have a very stable value. As you can see on the logarithmic chart below, one bitcoin is now worth 100s of times what it was worth two years ago, and 10s of times what it was worth one year ago. This is because while the number of bitcoins is growing quite slowly, the number of users, and the number of transactions using bitcoins, is growing rapidly, causing demand to outstrip supply. Because it is a young currency, bitcoin has had various "teething" problems, and some of these have caused wild swings in value. As the software is refined, as more vendors start accepting bitcoin, and more users choose it for their transactions, these wild swings should damp out. Over the next 10 years or so, the number of bitcoins in circulation will approach its final total, roughly double the number in the market now. But the number of users may well go from hundreds of thousands to millions, or even hundreds of millions… which means the value of bitcoins has a lot of upside. On the other hand, it is entirely possible that some flaw in the system may come to light, rendering bitcoins completely worthless. In any event, it is wonderful to see new forms of free market money offering choices for saving and facilitating trade. Thank you for this chart. I bought my first Bitcoins almost 2 years ago. The technology has potential to become the "gold of the Internet." The two currencies share many useful attributes. I look forward to watching this chart over time. What's up with the log scale y axis? It makes it harder to compare to other charts since the rest use a linear scale. Please create a chart with linear scales! Thanks. Hi Slavix, I’ve put the linear version up for you. You can download a PDF of it here. Thank you for these charts! I find them all to be immensely valuable. I think it's great that your interest in Bitcoin shows up in these charts and in your blog. Where did you get this chart from? And, where can we get this type of historical chart? I wouldnt mind trading bit coins, if i can chart them on my esignal. Hi Rizwan, The best source of charting data for Bitcoin is http://bitcoincharts.com. Good luck! 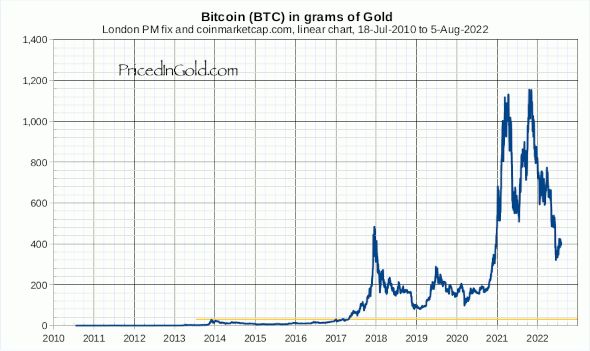 Are there any precious metal dealers that accept bitcoin ? Hi Purple, I know of at least one, http://coinabul.com. It so high at the moment, that its hard to get in, Id like to see it come down to near $50 before buying some. Thanks! Great to know that there is an option to be able to get gold via bit coin. However, I noticed their premiums are at least double from standard premiums regarding gold. It's still not a big deal as this gives you the option to acquire gold via bit coin! Thanks again for the link. Bookmarked! 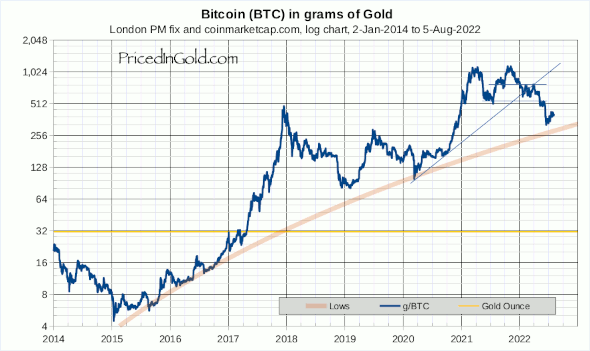 Can you and would you keep that linear scale-Bitcoin vs. Gold in mg chart refreshed and up to date? So we can have a look and be surprised how the markets do its magic? Or kindly mail me the data behing this chart, so I could program a script that does this for me. Hi Archie, I will add the linear chart to the Bitcoin page for you. If you want to generate your own chart, I suggest using http://bitcoincharts.com as an historical data source. More and more consumers are warming to the idea of bitcoin. One of the best things about doing business online with bitcoins is that it completely eliminates the chances of credit card fraud and identity theft. Also, with the recent spate of revelations about governments spying on people, the anonymous nature of bitcoin will appear to privacy advocates. 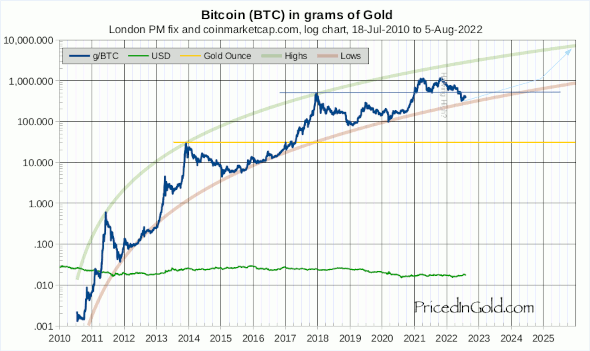 Is Mt Gox reliable as a source for bitcoin valuations? Apparently bitcoins are selling at a premium there because Mt Gox has legal problems that are making it difficult to get dollars out of Mt Gox accounts. Great question! You are right that there is a price difference, and I am studying this question. So far, it seems that the mtgox prices are still indicative, and mtgox still has much more volume than any other exchange or collection of exchanges. If I were to plot prices from any other (or from a collection of other exchanges) the chart would have the same shape, even if the absolute values were a bit different. I will keep an eye n this, and make changes to the chart calculation if mtgox loses its volume, or appears to be diverging strongly from the other exchanges. We're reaching gold oz/bitcoin parity soon! How incredible!